Buy the Series and Save! From general requirements to grounding and bonding, the 2014 National Electrical Code Online Training Series is a comprehensive introduction to today's NEC. Created by the leading experts in NFPA 70®: National Electrical Code compliance and only available by NFPA®, the self-guided 2014 National Electrical Code® Online Training Series introduces you to installation requirements and how the NEC works to protect people and property from electrical hazards. Each module helps pave the way for additional professional training to meet your career goals. Topics span everything from 2014 NEC organization, to the application of general requirements, conductor sizing, overcurrent protection, and grounding and bonding for systems and equipment. Complete this six-hour course series and qualify for 0.6 CEUs. Completion of each individual one-hour course qualifies you for 0.1 CEU. Upon successful completion of a course or the course series, participants will be prompted to download the CEU certificate directly from the course site. Work at your own pace to learn how NEC compliance provides electrical safety in residential, commercial, and industrial installations. Understanding the purpose, language, and organization of NFPA 70: National Electrical Code (NEC) is critical to proper interpretation and application of America's most widely adopted code. Developed by NFPA®, this self-paced online Introduction to the NEC Online Training Course provides you with the basis for such an understanding. The course covers the essential issues covered by Article 90 of the NEC as well as some general information needed for understanding of and compliance with specific NEC requirements. Introduction to the NEC -- the first course in the NEC Online Training Series -- consists of four lessons and a summary addressing the purpose and scope as well as the general organization and language conventions in the NEC. It also explains how compliance with the NEC and proper use and installation of electrical equipment leads to installations that can be approved by AHJs and others responsible for NEC enforcement. Complete this one-hour course and qualify for 0.1 CEU. Upon successful completion of a course, participants will be prompted to download the CEU certificate directly from the course site. This new online training course makes it easy to improve your understanding of NEC rules that apply to most electrical installations. The lessons in the 2014 NFPA 70 National Electrical Code: General Installation Requirements Online Training Course, the second course in the NEC Online Training Series, cover some of the most widely applicable installation requirements in the NEC. These are code requirements that apply to all or nearly all electrical installations for power and lighting circuits and distribution equipment. Some of these rules can be modified for the special occupancies, special equipment, or special conditions of Chapters 5 and 6, and although some of those modifications will be noted, this self-paced module concentrates on the general requirements that apply to all electrical installations and the rules that cover the proper selection and use of wiring methods. Without leaving your desk, you can learn the methods for properly selecting a conductor using today's National Electrical Code. NFPA®'s online training course covers many aspects of overcurrent protection, so you're better prepared for NEC compliance. Available only from NFPA, the NFPA 70: National Electrical Code (NEC) Overcurrent Protection Online Training Course, the fourth course from the NEC Online Training Series, explores the methods of protecting people, conductors, equipment, and other property from the effects of overcurrent. Work at your own pace through online lessons addressing the types of overcurrent and overcurrent protection as well as the selection of an appropriate type and rating of overcurrent device. This self-guided online course also covers the requirements for locations of overcurrent devices both in conductors and in the building or structure where they are used. You will also learn how to locate requirements for overcurrent protection in different types of conductors and for specific types of circuits or equipment. NFPA®'s NEC® System Grounding and Bonding Online Training Course gives you a solid introduction to a critical issue. Understanding the NEC requirements for grounding and bonding of electrical systems is vital, and the self-guided 2014 NFPA 70: National Electrical Code (NEC) System Grounding and Bonding Online Training Course lets you work at your own pace to improve your grasp of a complex issue. NFPA®'s NEC Equipment Grounding and Bonding Online Training Course takes you inside the Code. Developed by electrical safety experts at the Code source, the self-guided 2014 NFPA 70: National Electrical Code (NEC) Equipment Grounding and Bonding Online Training Course addresses the requirements for grounding and bonding of electrical equipment. Online lessons cover the reasons why the National Electrical Code requires non-current-carrying conductive parts of electrical and some non-electrical equipment to be grounded or bonded. You will learn about the definitions of terms that relate to grounding and bonding of equipment enclosures, conduits, structures, and piping systems; the performance requirements for equipment grounding; the equipment that is required to be grounded; and the methods of equipment grounding and bonding. Grounding and bonding of electrical conductors and systems are covered in another module in the 2014 NEC Online Training Series. 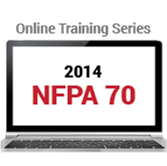 View this FREE interactive demonstration of a NFPA 70®: National Electrical Code® (NEC®) (2014) course! To view more online training demos for additional codes, click here.